Some time during Friday evening the Post Office at Clarendon Park was broken into and a sum approaching £20 taken from the till. The matter is in the hands of the police. The Chronicle doesn’t report whether the thief was caught in the weeks after the robbery, but I did find out a few interesting things. The post office in 1888 was on Queens Road. It was run by Henry Scorror, “stationer and agent” (Wright’s 1888 Directory of Leicestershire) and his wife Catherine. Letters and parcels were collected on weekdays at 9.50am, 2.10pm, 3.30pm, 7pm and 8.20pm. By 1891, as the population of Clarendon Park increased, collections were also made on Sundays. The address was now 83 Queens Road – where the current post office also stands. It’s amazing how much longevity of service these Clarendon Park shops and businesses have seen! In 1891 Henry Scorror lived at 39 Montague Road in 1891 with wife Catherine Burnet née Bethell, his children and servant. He died in Queens Road on 1st January 1893 aged just 39. Catherine kept up the post office at 83 Queens Road, with the assistance of daughters Annie Burnet Scorror and Edith Dorothy Bethell Scorror, living in rooms above the shop. She was still sub-postmistress in 1916, but retired some time before 1925, when daughter Annie was in post (now as Mrs O’Connor). Catherine died 9th January 1936. I’ll be visiting Leicestershire Records Office on Thursday to find out how long the Scorror/O’Connor family were in charge of Clarendon Park Post Office. The British Postal Archive will also be a port of call one of these days. And I must speak to the lovely chaps who run the post office today to see if they can tell me anything about its history. As always, half an hour of research brings up many more questions than answers! regards, Elizabeth. Ok so the title of this article was a bit naughty. There was no directory of Clarendon Park businesses in 1909 (Nowadays we have The Clarendon Directory, delivered free to our doors). But there was a selection of directories available for Leicester folk to find their shops, businesses, gentry and postal delivery times, and I thought it would be interesting to list the businesses listed under Clarendon Park addresses. Actually this is part of a much larger project I am working on, to record all the businesses and in particular the shops of Clarendon Park from its earlier days to the present. I love the fact that there are and were so many shops here, and there is still a lot of evidence remaining of the shops that have long since been turned into private dwellings. I love the fact that Clarendon Park had not just one, but two aerated water manufacturers (one of which was our friend William Tom Hind). Also that there were so many butchers, bakers, greengrocers and fishmongers. All of which still exist in Clarendon Park today, but not in anything like the numbers. We could blame Sainsbury’s (or Jacksons, as it was until a few years ago), but there has always been a Co-op in Clarendon Park Road and I would guess that people’s changing cooking and eating habits are just as much to blame. I am just grateful there are still useful shops to be found. Regards, Elizabeth. You didn’t think I was talking about today, did you? Certainly not. From as early as 1887, with half of Clarendon Park still not built, people were already complaining about the state of the roads. A correspondent writes from Clarendon Park, calling attention to the bad state of Clarendon Park-road and Queen’s-road, and urging the authorities to put them in good repair and charge the owners with the cost. He understands that part of one of these roads belongs to the borough, and thinks the town authorities ought to make their own part good. If there’s one enormous difference between newspaper reporting in the 1800s and newspaper reporting today, it’s the lavish attention to detail of the past compared with the present. To the point that you begin to wonder how people stayed awake whilst reading it – though I am very grateful as a local historian. Here we have an account of a gas explosion in 1898 on what is now known as Welford Road, but I have seen described in old documents as Wigston Road and Bosworth Road. Two sisters had recently moved into a brand new house (which sadly I have not been able to identify), and their landlord popped over to tap a barrel of beer for them. The pantry was too dark for him to see, so he called for a light. One of the sisters brought him a candle, but there was a gas leak and the pantry exploded, sending the landlord and his tenant flying into the kitchen. The landlord escaped to raise the alarm, but poor Sarah Hall was unconscious and badly burned. Meanwhile her sister Annie was in bed upstairs, and the staircase was so badly damaged that it wasn’t safe for anyone to rescue her. Luckily a man was driving a ladder past the house – this being a busy road – and he carried the woman out. The doctor was called and he summoned the horse-drawn ambulance (imagine being bumped about in that all the way to the infirmary). I can find no record of Sarah dying, so I assume she survived. As to the house – well, not surprisingly Annie and Sarah moved before the 1901 census. I’m pretty sure I wouldn’t have wanted to stay either. Now both of the ladies must have been invalids (Annie was already bed bound at the time of the accident). The landlord, John Hurren, must have been pretty devastated too – not only did he receive head injuries and the loss of his tenants, but his brand new house was badly knocked about and must have needed expensive repair works. For those interested to read (nearly) the whole report, here it is. Regards, Elizabeth. About ten o’clock on Friday morning, a serious explosion of gas, resulting in severe injuries to one person, and lesser injuries to another, occurred at a house in the Wigston-road, Clarendon Park, the residence of two maiden ladies of middle age, named Miss Sarah Hall and Miss Annie Hall. At the request of Miss Sarah Hall, the landlord, Mr. John Hurren, Euston Villa, Clarendon Park Road, called at the house for the purpose of tapping a barrel of beer. He went into the pantry, which is just under the staircase, but finding it in darkness, called to Miss Hall for a light. She at once lit a candle, and came to the pantry door, but th moment she reached the threshold a terrific explosion occurred, and she was thrown violently backwards into the kitchen, while Mr. Hurren was also knocked down and badly injured about the face and head. He managed, however, to struggle through the thick smoke and dust caused by falling ceiling and mortar into the back garden. He had not gone many yards when he met Mr. Wilson, who lives next door, and who, having heard the explosion, was hurrying to see what was the matter. Mr. Hurren, who was dazed and bewildered by what had occurred, called out “There’s another inside.” Mr. Hurren immediately made his way into the house, and discovered Miss Sarah Hall lying unconscious on the kitchen floor. Lifting her up, he managed to carry her outside, and then with assistance, conveyed her to a neighbour’s house. Dr. Hunter, who lives in Clarendon Park, was immediately sent for, and in the meantime some members of the St. John Ambulance Association at the Wheatsheaf Works, having heard the explosion, and rendered all the aid they possibly could to the injured lady and Mr. Hurren. On his arrival, Dr. Hunter, having ascertained the grave nature of Miss Hall’s injuries, ordered her immediate removal to the Infirmary. The fire brigade horse ambulance was summoned by telephone from the Wheatsheaf Works, and the unfortunate lady was removed to the Infirmary in a still unconscious state. She had sustained very severe injuries to the face, neck and chest, and was suffering from violent shock. After the injuries of Mr. Hurren had been dressed he was able to return home. Miss Annie Hall is an invalid, and was in bed in the front room upstairs when the explosion occurred, and was naturally very much alarmed and upset. So great was the force of the explosion that the staircase was twisted round and jammed into the wall in such a manner as to render access to the upstairs rooms by that means too dangerous to be attempted. Attracted by the noise of the explosion, a little crowd of people quickly gathered in front of the house and fortunately one of their number, a man named William Chalk of 6, Burns-street, happened to be wheeling a ladder on a truck. The ladder was placed against the house, and Chalk himself climbed into the bedroom, and bore the imprisoned lady through the window in safety to the ground, conveying her afterwards to a neighbour’s house. Superintendant Howe, in charge of the district, was communicated with, and arriving on the scene with all possible despatch, did everything in his power for the injured people. There can be little doubt that the explosion was caused by an accumulation of gas within the pantry, but whether the leakage arose from defective fittings or from a burner being left on cannot be definitely stated. That the accumulation, however, was considerable, was shown by the force of the explosion, and the consequent damage to the interior of the house…..every panel of the door leading to the kitchen was blown out, and the top panel in the front room window smashed….the walls on either side of the pantry were bulged out. The interior of both kitchens was a scene of desolation. Everything was smothered by the fallen debris, and the furniture twisted and broken. The damage was not extensive in the front room, but the cornice was all knocked down, and the furniture displaced. The house has been built quite recently, and the Misses Hall were the first tenants. A chemist in Queens Road for 100 years? 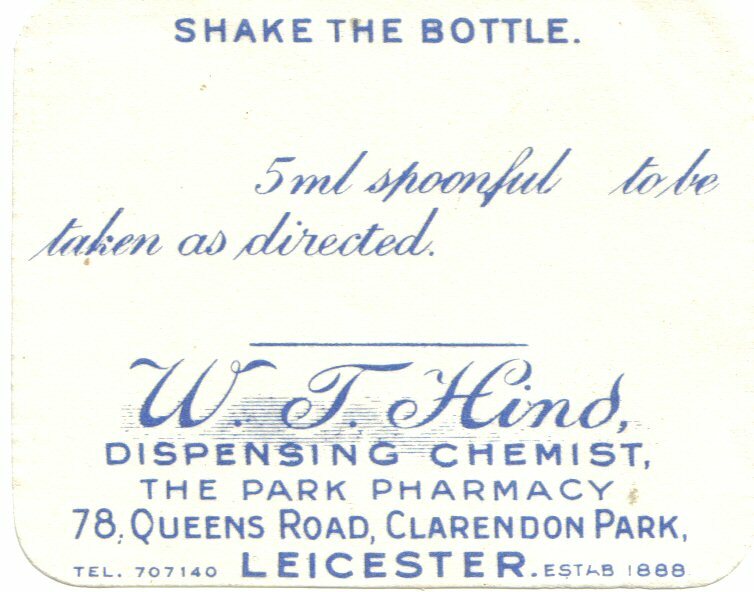 Let’s take a look at one of Clarendon Park’s businesses of the past, a dispensing chemist – W T Hind, of 76-78 Queens Road and also of 44 Montague Road. 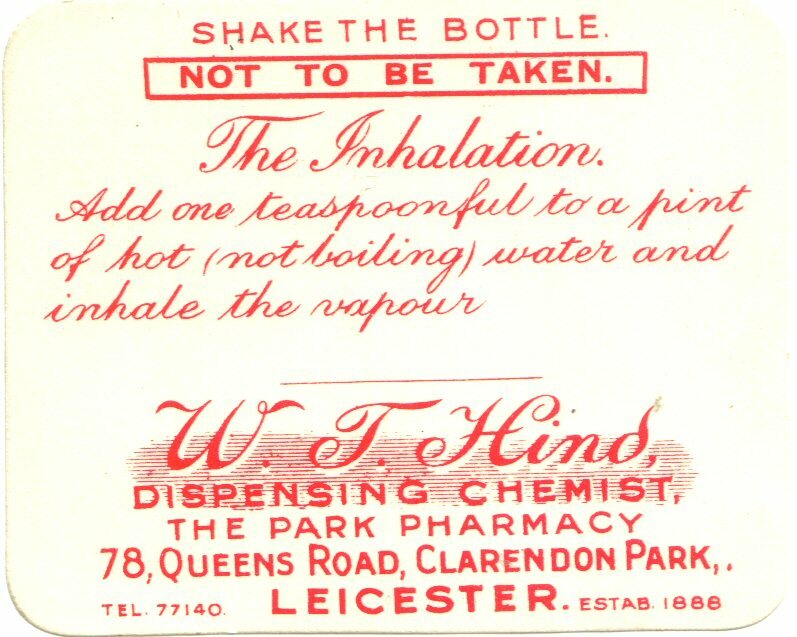 I bought this label on ebay a year or so ago, and it got me interested in chemists in Clarendon Park. I started looking into W T Hind and his business, and have uncovered quite a lot of information and sources. I am planning to post information here as I find it. If only Leicestershire Record Office wasn’t closed for stocktaking this week I could tell the whole story in one go but hey ho. The 1947 Kelly’s Directory of Leicester shows the following entry: “Hind, William Tom, 76 and 78 Queens Road and 44 Montague. Telephone number 77140.” The same telephone number is shown on the Inhalation label, which helps us to put a rough date to it. 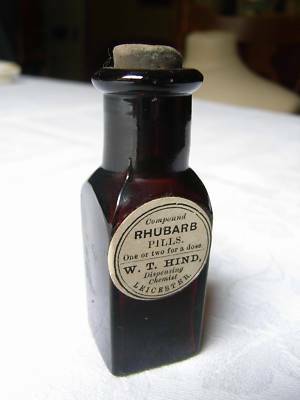 Being in business for a long time was a good selling point in past times – less so now, I suppose – so Mr Hind helpfully put the date he started the business, 1888, on the label. So, looking at the 1891 census we find William Thomas Hind living not above the shop in Queens Road, but with his mother in St Peter’s Road. He is a Chemist and Druggist aged 24, born in Leicester. If his business started in 1888, he must have been just 21 at the time. He seems to have moved house a lot at this time, living all over the city. By 1901 he had married Lizzie Smith and helped produce three children. The whole family now lived at 78 Queens Road with their servant. In Wright’s 1909 Directory of Leicestershire Wm Tom Hind, 78 Queen’s Road, is the only chemist and druggist listed, which might explain why in 1911 the family (now with another daughter) lived at ‘Lindenhurst’ in East Avenue, Clarendon Park, a decidedly swisher address. The eldest son, Horace William, is a pharmacy student. This was a very long lived business. In Kelly’s Directory of Leicester 1957, another chemist is listed, Frederick Leonard Hind (William Thomas’s third son, born in 1900). There are now two telephone numbers and we are also told that they are dealers in photographic apparatus and materials. In 1896 William had been granted a license to sell ‘medicated wines’, which is amusing when you consider all the other interesting potentially recreational chemicals a chemist could legally sell in those days. In fact, there are a lot of W T Hind bottles and labels still kicking around, which give you an idea of how the shop must have looked and smelled. W T Hind was still in business in 1984 – almost 100 years (Not the W T Hind though I hope – unless his pills were REALLY good!). Over the next few days I hope to find out exactly when the business ended. As to the premises – 78 Queens Road is currently home to the Co-Operative Pharmacy, formerly Gordon Davis pharmacy. It is funny how business premises sometimes retain the same use for a long time. 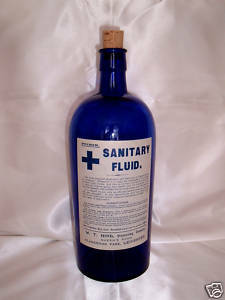 It may well not have been used for any other purpose since it was first built. 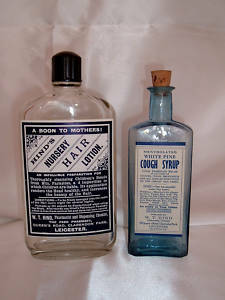 More on W T Hind and its competitor for the oldest pharmacy in Clarendon Park, Spiers, soon. In the meantime, I’d love to hear from anyone who remembers W T Hind. Regards, Elizabeth. A shunter in the employ of the Midland Railway Company, named William Covill Taber, of Lytton-road, Clarendon Park, met with a serious accident at the Knighton Sidings, early on Wednesday morning. Taber, who had finished duty a few minutes before, and was just about to go home, missed his footing while alighting from an engine, which passed over his right leg, and badly mutilated it. He was immediately conveyed to the Midland Station on a special engine, and was taken thence to the Infirmary on a stretcher. It was found necessary to amputate the injured limb, and the poor fellow is doing as well as can be expected. William Covill Taber was 24 when he lost his leg in this horrible accident. He had been married for less than two years to Florence Sarah Izzard, a woman from London. He was a country lad from Cambridgeshire, having moved to Leicester presumably to find work. Becoming disabled in late Victorian England was pretty grim – no state support was available except parish relief, and that usually meant the workhouse. 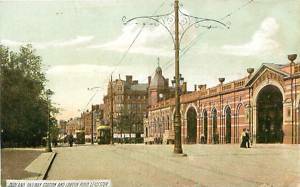 Perhaps the Midland Railway Company offered compensation and support. They certainly continue to employ William, as in 1901 he was a railway porter and in 1911 a railway goods checker. I wonder whether he had a wooden leg? Regards, Elizabeth.